“We realised there are risks in peer-to-peer lending that can be mitigated, as banks do when seeking investors for their lending. So we replicated this structure to mitigate those risks. Under the name Marketlend, we offer a marketplace lending solution using a hosted system that manages the entire peer-to-peer lending process. This service is further enhanced with insurance, a robust legal structure, predictability software for the rating of the risk, and a secure payment system. The process from application to paying the borrower can be a short as 10 minutes. Marketlend Pty. 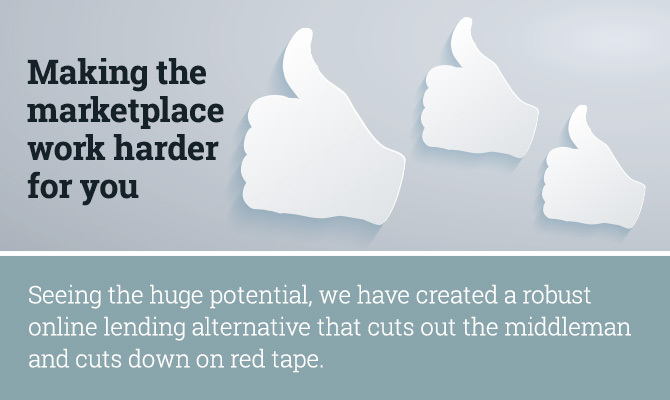 Limited is an online marketplace lender, or otherwise known as a peer-to-peer marketplace. Marketlend and its representatives manage the registration of borrowers, investors, originators, and affiliated parties. The information on the marketplace lending platform operated by Marketlend is presented on the basis that it is received. Marketlend makes no warranty or representation of the accuracy of the data or information on the marketplace lending platform. 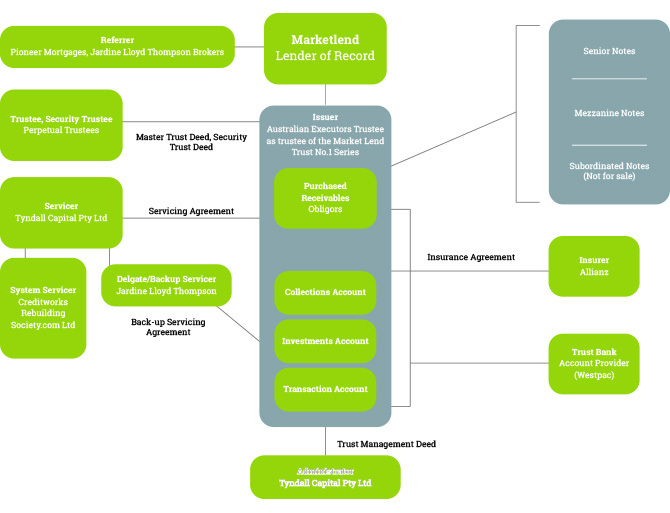 The issuance and sale of notes by a member investor; and the origination, servicing and collection of the principal and interest and other charges payable on the loans are managed by Marketlend, a wholly owned subsidiary of Tyndall Capital Pty Ltd.
Investors to participate on the marketplace lending platform are authorised to offer their notes for sale to other investors through the trading platform provided by Tyndall Capital. Tyndall Capital may use Registered Brokers or Dealers to trade notes. A listing of the borrower’s loan on the platform is called a borrower loan or note. Approved investors can invest in listings and purchase from Tyndall Capital notes that are dependent for the payment received by Tyndall Capital on the corresponding borrower loan described in the listing or part thereof. All loans are originated through the platform are made by Marketlend or approved intermediaries of Tyndall Capital.